MEROBEL tension control systems, clutches and brakes are fitted to the majority of machines used in the Converting, Printing & Packaging Industries, as well as Automation / Material Handling, Wire and Cable, and Test rigs. The Merobel tension systems are manufactured to the highest quality and are the leading product on the market today. MEROBEL offers a wide portfolio of dedicated products: high technology mechatronic components such as EMP Tension Brakes & Clutches (Electromagnetic Particles), Electronic Tension Controllers, various material sensors and transducers for very accurate force and tension control. For many years, one of the labelling industry’s major trends, either in printing or finishing operations, has always been to process thinner, more technical, and often more fragile substrates. 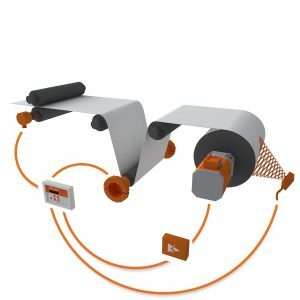 Thus, solving web handling problems such as slack webs, product stretching, lost of registration, or product breaks, has become not only an interesting way to improve quality and to reduce waste, but also an imperious concern for production teams and plant managers involved in label printing and finishing. With 50 years of experience and thousands satisfied customers behind them, MEROBEL’s engineering team knows that improving tension control is usually the optimal way to enhance the performances of a new equipment, or to refurbish an existing machine, and therefore it goes right to the heart of almost every web handling problem, the web tension control. 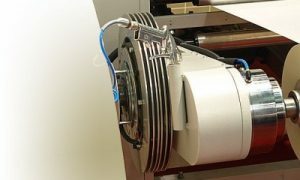 Their vast field experience has clearly shown that even using the world’s best brake technology, a web tension control system has to include controllers and sensors in order to reach its goal, which is to guarantee accurate and consistent tension levels on the running product, according to the application requirements (which might be up to 1% precision). MEROBEL’s ready-to-use web tension package enables everyone to safely increase the linear speed, the production quality and its flexibility, and to dramatically reduce the amount of waste. DGT300+, launched by MEROBEL as the most recent digital controller, is a concentration of advanced technology. The device includes both the smart hardware allowing high speed computations, and the highly versatile software able to cover any sort of tension or torque control application and to deal with the widest range of web tension application parameters: web elasticity, bobbin rotational inertia, continuous or stop and go running process, range of diameter variation, etc. Designed for both closed loop and open loop tension control, the DGT 300+ is the up-to-date turnkey solution for unwinding, rewinding and intermediate tension control applications. Allowing 100% of the system setting up through its user friendly Windows PC interface (with touchscreen features fully available), or through its front panel keyboard, this digital controller includes all the web tension control specific functions required: E-stop proportional to the set point, soft start, hold & release, taper tension, no-stop splice turrets, etc. Amazingly this DGT300+ Windows PC software is supplied for free along with the controller. 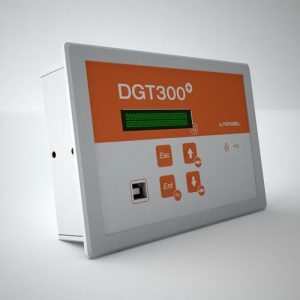 The DGT 300+ also features the most advanced data exchange protocols such as Modbus TCP/IP which allows direct connection to the main machine’s PLC. The Windows PC software enables modern communication functions like distant remote control, troubleshooting analysis, and system diagnostics. For instance, these exclusive communication features enable the user to have overseas setting-up procedure through the Internet, such as has been done many times from Europe to Japan, China, or to North America. Compatible with any usual position sensors, US sensors, and all available load cell technologies, the particular design developed by MEROBEL’s engineers gives the benefit of fully digital calibration procedures making setting up and operating the system childs play. Advanced regulation features are also offered, such as automatic PID coefficient variation, open loop + closed loop control combined inertia compensation, smooth start up with programmable slope as well as motors and drives specific algorithms. In addition, direct control of EMP tension brakes & clutches is available through the built-in power amplifier, while drive control can be made through the standard analogue output. The tuning is easily done through a simple Windows PC interface which offers the advantage of better flexibility for fast changes of production batches. This is of course a major benefit as it is crucial for the maintenance teams, wherever they are in the world, to be able to read and modify all the parameters, and to make data records of the inputs / outputs for easier troubleshooting. 100% dustless and recyclable by design, the wide range of cost-effective EMP tension brakes and clutches built by MEROBEL gives the benefits of a smart and environmentally-friendly technology. 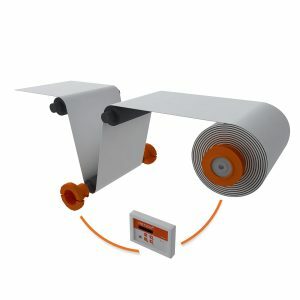 It combines flexibility, accuracy, quiet operation and low power consumption. The characteristic curve “torque-versus-current” is a linear one (avoiding the step effects experienced with friction brake pads, or the cogging torque which goes along with hysteresis technology). Specific developments made by MEROBEL on surface treatment as well as exclusive powder composition helps to improve the natural noiseless-and-long-life features of the EMP Tension Control Technology. The high reliability of the MEROBEL EMP tension brakes & clutches comes from a combination of many different design improvements introduced over the last few decades. It includes factors such as improved magnetic properties, magnetic powder composition, sealing quality, thermal resistance, and ball bearing optimisation in order to resist higher temperatures. The company’s understanding of thermal capabilities has been dramatically improved by the computerised thermal models applied through CAD software to the brakes design.The accurate simulation of working conditions allows to finely define the temperature level in all of the crucial parts of the brake, and to easily select the best cooling system option for the application (cooling fins, axial fan, radial fan, or water jacket cooling system). 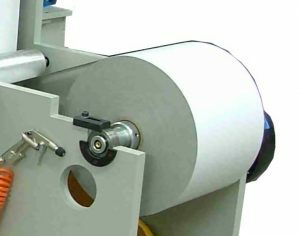 Because the versatility of narrow web label machinery has to be considered more and more, the available overall range of rated torque, from 2 N.m to 1,000 N.m, becomes crucial. The web diameter ratio between full and empty is usually about 1 to 10, when the width ratio can be 1 to 4. Furthermore, the material range which can be processed on the same machine leads to a wide product tension variation. For instance, looking for printing from 12µm BOP to 600µm cardboard on the same press means a typical material tension variation from 1 to 20. The capability of the EMP tension brake technology to offer the widest available continuous torque range is one of its key benefits. The range of EMP tension control brakes & clutches offered by MEROBEL is the widest on the market. POS+: dedicated for dancer position feedback. It is a contactless Hall Effect potentiometer able to cover a wide angle with high resolution, linearity and high response time, this last point being important for every dancer application. NR7+: the solution for diameter measurement. Able to work up to 1meter range, it is simple solution when diameter feedback is part of the regulation (open loop, rotation speed calculation or variable PID function). 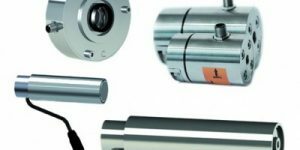 WAT: New load cells series, cartridge (WAT-S), slim profile (WAT-B), cantilever up to 450mm integrated roller (WAT-C) or cantilever for ribbon & narrow web up to 200mm (WAT-N). 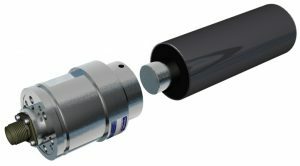 They are robust, accurate and easy to implement on the machine thanks to a unique bolt fixation and classic M12 connector. The WAT series offers by design low deflection and repeatable high accuracy.